Faith - All the Spiritual Strength That One Needs! 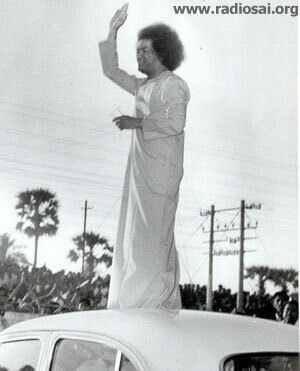 This is the transcription of the talk delivered by Sri Hemant Kumar in the Divine presence of Bhagawan Baba. 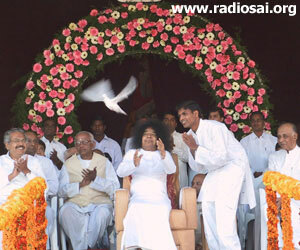 Invoking the Blessings of Mother Divine, Sri Sai Saraswathi, upon all gathered here. Loving and Humble Salutations, oh Mother Divine, at Your Lotus Feet. Esteemed elders, dear brothers and sisters, Sai Ram to all of you. In a clearing in a forest there stood a huge banyan tree. It had a gigantic trunk and mighty knolled prop roots, and sturdy branches. And on one such sturdy branch there was a lean twig on which sat a tiny sparrow. A slight breeze set the twig into a harmonic oscillation, and the sparrow chirped in with rhythm. The breeze slowly turned into a wind and the sparrow's seat shook violently. But the sparrow just continued chirping with none to listen to its melody. The wind turned fierce and roared; the sparrow only twittered. And in the asymmetric battle that continued, the twig snapped, unable to bear the onslaught. What happened to the tiny sparrow? It was September 28, 1995 . I was in my eighth standard. Bhagavan had given our entire class an interview with Him. I was fortunate enough to be sitting right at His feet and looked up and asked Him (mentally): "What happened to the sparrow?" At this point in time, Bhagavan was narrating the very same incident. He looked into my eyes and gleefully added, "It spread its wings and flew away." The answered reached home. Bhagavan then continued to explain, "Man lives in this world and builds for himself a home, housing in it all that he has acquired in life. And he sits in this house and twitters to the tune of life. But when the winds are not in favor and the world comes crashing around him, he hops about lamenting his plight." The tiny sparrow on that branch did not depend upon the twig, or on the branch, or on the gigantic trunk of the mighty banyan tree. It depended on its wings! So too in life, let us depend not upon mere twigs of passion and fashion, of pain and gain, of wealth and glory. Let us rather depend upon wings of Faith. Faith in His Name, in His Love, in His Glory, in His Benevolence, and in His Benediction! Give us, Lord, the ability that we develop these wings of Faith, for when the tempest becomes more stormy than we can bear, we can spread these wings of Faith and glide effortlessly to our destinations. A mother loves a child for she has Faith that it is her own. A child loves his parents for he has Faith that they are his own. I stand here to speak for I have the Faith that what I speak is what I feel. And on a lighter note, many of us would have unkempt hair if we did not have the Faith that the barber in the salon would cut our hair and not our neck. And where there is Bliss, there is God! What better inspiration is there to repose our Faith upon than Him seated in our midst, the Supreme Godhead, the source of Supreme Love. Oh Lord! My mind and thoughts stand flabbergasted when attempting to scale the heights of Your Benevolence and Magnificence. Let us develop our Faith towards You. It so happened that once sage Narada upon his tour around the world in spreading God's Glory happened to meet a devotee of the Lord sitting under a huge banyan tree. Upon seeing the great sage, the devotee prostrated before him and said, "Oh great one, when will you be going to Vaikuntha to meet the Lord?" Narada replied, "After my trip around the world spreading the message of the Lord I will surely go to Vaikuntha." The devotee then put forward his prayer. "I have been meditating for so many years. Please ask the Lord when He will give me His Darshan?" And so the sage consented to put forward the prayer of this devotee and proceeded to Vaikuntha. There Lord Narayana asked him, "Narada, what is your news?" Narada then put forward the prayer that the devotee had made and Lord Narayana said, "Tell the devotee that I will give him Darshan only after a number of births, a number equal to the number of leaves on the tree under which he is meditating. Narada was dejected, but He was only a messenger and so he went to the devotee and said, "You fool. Couldn't you find any other tree to meditate under? Of all the trees, you chose a banyan tree! The Lord will surely come to give you Darshan but it will be after a number of births, equal to the number of leaves on the tree under which you are meditating." And that moment a strange thing happened. The devotee went into a fit of ecstasy and the Lord appeared on the scene. As Narada stood there, fuming and fretting, the Lord and the devotee met. It was like a calf running to meet its mother, or a river surging to meet the ocean. 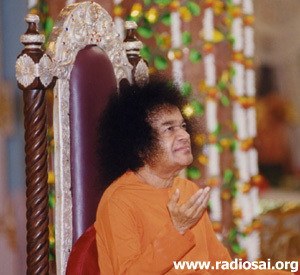 After the union, the Lord came to Narada and said, "Narada why do you look so upset?" Then Narada said, "Lord, you may not have any value for your words but I have some value for mine. You said one thing and did something so contrary to it. Please explain." Then Vishnu went on to explain: "It is the Faith the devotee had. He had Faith ? complete Faith. I had given my assurance. It does not matter how long it will take, but I had given my word, and that Faith gave him all the joy that I am going to give him Darshan, and so I had to break My Word and appear in front of him." What is the path to God? There is no path to God! Who is the source of our Faith? It's a jump, for it's an abyss! In this quest for God, it is a question of 100% Faith or no Faith at all! Even 99.999% won't do! In this domain of God there is no question of "if" and "but." Every "if" and "but" is "cut"! It's a question of 100% Faith or no Faith at all. But the plight of man is so miserable that he is ready to believe in anything and everything except his own inner voice. Every time we get into a bus we place our life in the hands of the driver, a mortal like us. But when the Jagad Guru comes and says, "My child, give me your heart and I will ferry you across the ocean of life," you are not interested. When the calendar says tomorrow is Thursday, you'll stake your life on that. But when He who has put the sun, the moon and the stars in their places and comes to you and whispers in your ear, "My child, follow My words," you seem disinterested. Is that our Faith? Is that our belief in His word? Bhagavan narrated this experience which happened thirty years ago. A devotee from East Godavari had come to Bhagavan and prayed to Him to come for a house warming ceremony ? the Graha Pravesham. 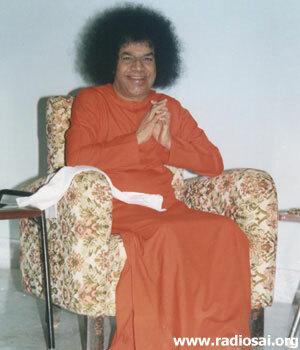 Swami consented to his prayer and fixed a date when He would be there. He even said, "I will be there on that day at 9:00 a.m." Given this Divine assurance, the devotee made all preparations for Bhagavan to visit his home in East Godavari. As usual, the yearly rains came and played havoc with the lives of the people. And that year too a cyclone hit East Godavari. As the Godavari River began to swell, so too did the hearts of the devotees with prayer. But God had given them His word and assured them that He will be there. And they had belief in that. Swami says: "There may be people who suffer because they do not have Faith, but there is no one who will be let down if he has Faith." Based on this assurance, they made ready to receive Bhagavan in East Godavari. With all this going on, unmindful of what transpired between God and His devotees, Nature continued to pour down relentlessly on East Godavari. The only connection East Godavari had with the rest of the world was the old bridge at Rajahumdry. For obvious reasons, the district officials closed the bridge and no transportation was now possible across the river. But Bhagavan had said He would go. And so, on the due date, He set forth with a few dignitaries to East Godavari. When they approached the river it was in full spate. The district officials tried to dissuade the party from attempting to cross the bridge. They insisted that Swami had to give a declaration that He is taking the journey at His own risk. Consider the irony of the situation where God had to assure them of what He does. "Nothing Will Happen To Anyone Who Is With Me!" Bhagavan wrote there: "Nothing will happen to anyone who is with Me!" Who can give this assurance except the Lord of the Universe? And so, a small boat was arranged to ferry Bhagavan across to the other side. And it was in such a position that it had to go under the bridge to reach the far shore. The devotees gathered on either side of the river to see what would happen. By now the water level had risen so high that when the boat reached the bridge it was lashing the roof and there was absolutely no space for the boat to pass beneath it. The people waited eagerly and anxiously wondering what would happen. Bhagavan instructed the people in the boat, "Close your eyes. Do not watch what will happen." Then, in a fraction of a second, the boat suddenly disappeared and appeared on the other side! Imagine the roar of the devotees on both sides drowning out the roar of the river. The joy that surged through their hearts was greater even than the flood arising from the Godavari River. And as promised, Bhagavan reached the home at exactly 9:00 a.m. During a public meeting He said, "When I came as Rama, the ocean gave way; it had to give! When I came as Krishna , Yamuna gave way! 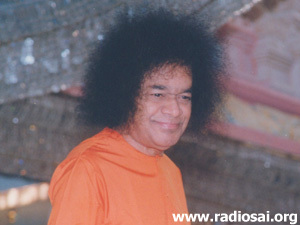 When I came as Sai, what is Godavari?" This Lord of Puttaparthi will never give you up ? He will never forsake you. This ocean of mercy will take you by His hand and guide you across. You will never be abandoned. Bhagavan speaks of Faith as a fire. Small fires are easily put out by the slightest wind; so are small Faiths by the slightest winds of doubt. Our Faith should be like that of a forest fire. Oh Lord, let this Faith that You instill in us light the lamps of Love in our hearts so that it dispels darkness, ignorance and slothfulness. Lead kindly Light amidst the encircling gloom. Lead Thou me on; the night is dark and I am far from home. The distant scene, I do not ask to see. One step enough for me.